The Suspicious Software Alarm System included with Trend Micro PC-cillin Internet Security 2007 can cause problems with TurboLaw Time and Billing. These problems can make certain features of TurboLaw Time and Billing work improperly, or even cause unexpected crashes. Note: These symptoms apply only to Trend Micro PC-cillin Internet Security 2007. Specifically, the Suspicious Software Alarm System can pop up repeatedly while trying to use TurboLaw Time and Billing (as well as while using other programs). It is very easy to accidentally click "disable" instead of "allow" when these pop up windows appear frequently. If a part of TurboLaw Time and Billing is disabled, it will not work properly. To resolve this problem open Trend Micro PC-cillin Internet Security 2007 and click on Virus and Spyware controls. From here, you can either disable the Suspicious Software Alarm System, or re-enable just the programs that you accidentally disabled. 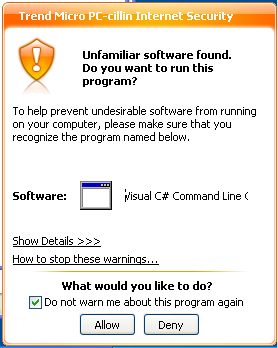 In particular, if the program Visual C# Command-line Compiler (csc.exe) is disabled by the Suspicious Software Alarm System, TurboLaw Time and Billing will be unable to display printed output. For specific instructions on how to use the Suspicious Software Alarm System, please consult the help documentation that came with Trend Micro PC-cillin Internet Security 2007.